Click here for a brochure front. Click here for a brochure back. 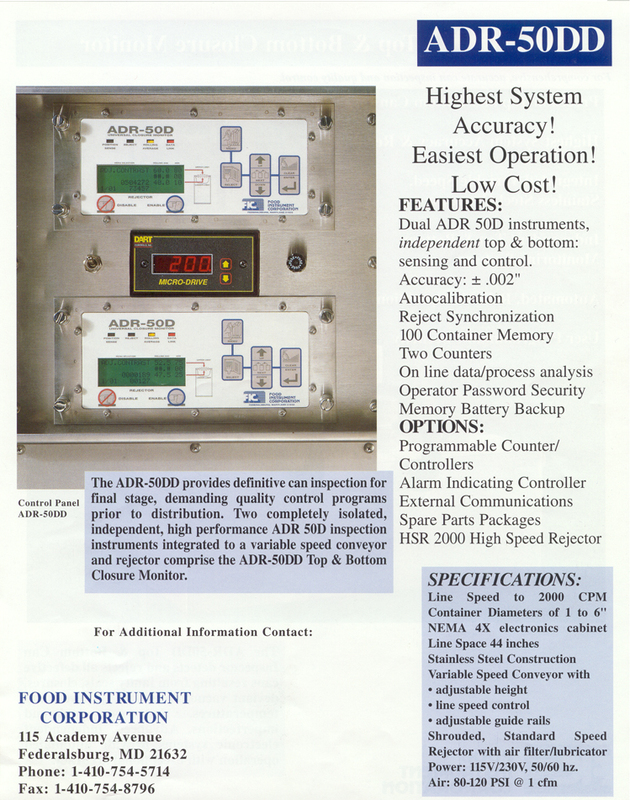 The ADR-50DD provides comprehensive, precisely accurate on-line inspection and control over vacuum, pressure and container leak defects of sealed containers with metal, or metalized closures of 1 to 6 inches (25 to 150 mm) in diameter. Dual ADR-50D inspection instruments provide true variable speed independent TOP and BOTTOM precision identification and control over all common mechanical and process related defects such as missing & misapplied lids (cocked caps, loose lids, damaged lids, misplaced covers), low/high internal pressure or vacuum deviations, false seams, knocked down flanges, pin holes, sideseam leakers ("leakers"), "swells", dents, deformed containers and defects resulting from extreme deviations in fill level (empty containers, and/or over and underfills) and temperature (containers filled at other than normal fill temperatures). 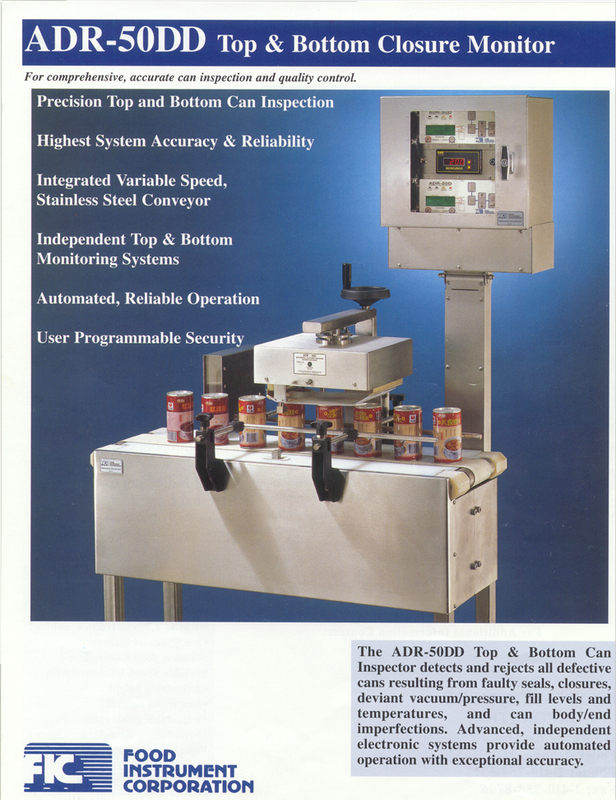 The ADR-50DD system integrates two complete, independent ADR-50D's each with advanced digital, microprocessor-based universal closure monitors to perform simultaneous Top and Bottom inspection with a variable speed conveyor which in combination with the sensing inspection head reference strip positions superbly stabilized containers yielding unsurpassed accuracy, precision, reliability and Total Quality Control. The ADR-50DD is ideally equipped to provide definitive container inspection for the most demanding quality control programs. Internal Battery prevents file and data loss at source power interruption. Infrared Position Sensors use a fixed mounting system, centered to the sense	probe axis and require no readjustment to individual container or closure diameter. Stainless Steel Shrouded Standard Speed Rejector (with air filter/lubricator) ejects defects off line. Maximum recommended rejector line speed is 800cpm. Higher speed rejectors available. 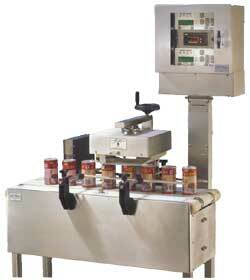 Electric Power: 115/230 Volt, single phase, 50/60Hz; other power ranges available.